One of the key subplots from Juventus’ 3-0 aggregate win over Barcelona in the Champions League quarter-final was the return of Dani Alves to the Camp Nou, and the right-back admitted it was slightly painful to inflict defeat on his old team. Alves featured heavily in both legs as the Old Lady kept two clean sheets to book their place in Friday’s semi-final draw. “It was tough, we knew it was going to be a tough game,” the Brazilian told BeIN Sports. “I’m happy for my team and my teammates, but I also have a bittersweet taste for coming back here after so many good times. 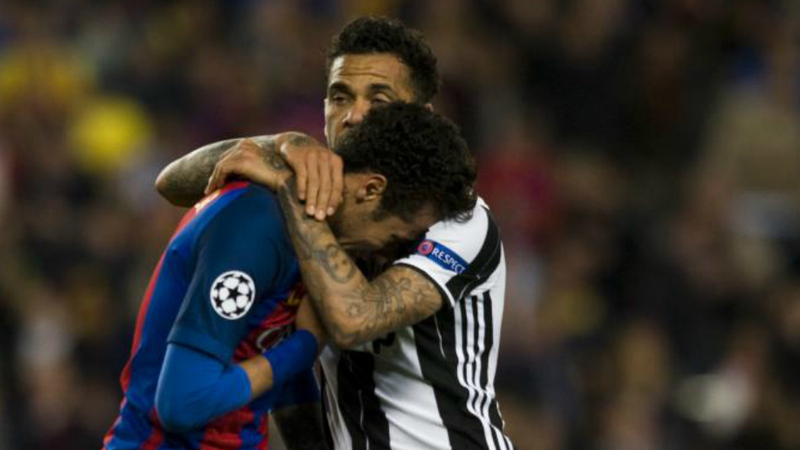 After the final whistle, Barcelona forward Neymar was utterly disconsolate and Alves spoke of how tough it was seeing his countryman so upset. “I’ve told [Neymar] that this is life, unfortunately we had to face each other,” he continued. “I did not want to measure myself just on this, we have lived these moments together and now we live them apart so it is hard. In the final four for the second time in three years, Juve could come up against Real Madrid, Atletico Madrid, or Monaco in the semis.